Last week we meet Erini, one of our REACH reps, and this week I'd like to acknowledge other student leaders. The role of a student leader is varied and at times challenging as you are an important link between teachers and students. 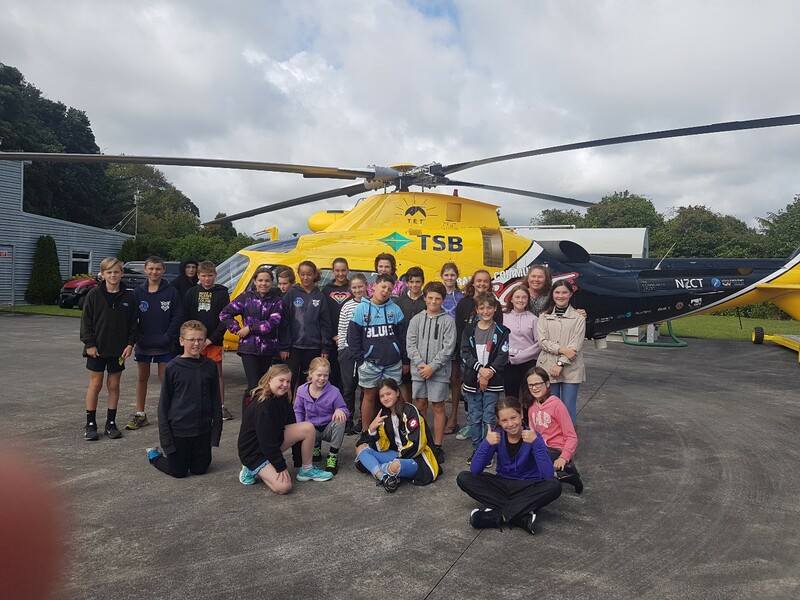 Whether you are a REACH rep, Playground Leader, House Leader, Enviro Crew, Sports and IT leader, Kapa Haka or School Council member you all have a great job to do, and as Leaders become role models for our younger students. Today I'd like to introduce our sports leaders: Luke Phillips, Kaitlyn Antill, Alex Van Burgsteden, Kade Langridge, Reef Ward, Hayley Storer and Cameron Ker. 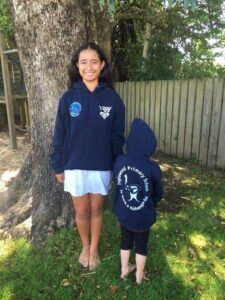 Over the next 2 weeks many of our teams are heading out and about our local environments and educational sites- to Tawhiti Museum, Rotokare Reserve, and Purangi Kiwi Reserve. These are all part of our wider theme 'Kaitiakitanga'. Students will learn about the history, make connections to landforms and maybe meet a Kiwi in the wild and have a better understanding of the natural wonder of Taranaki. Truly fantastic experiences for our students. Again we must thank our parent helpers and the teaching staff, that plan, organise, and often reorganise to get it right. We're sure all students will remember to be REACH role models when out in these amazing environment. 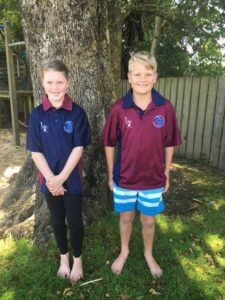 Lastly, best luck to Mr Frost and one of our parents Aaron Zame, who beginning on Friday are playing in the Taranaki Premier 3 day cricket final at Pukekura Park, as their Inglewood team take on New Plymouth Old Boys'. I'm sure Mr Frost will be excited to get to school Monday to tell his class tales of the game. 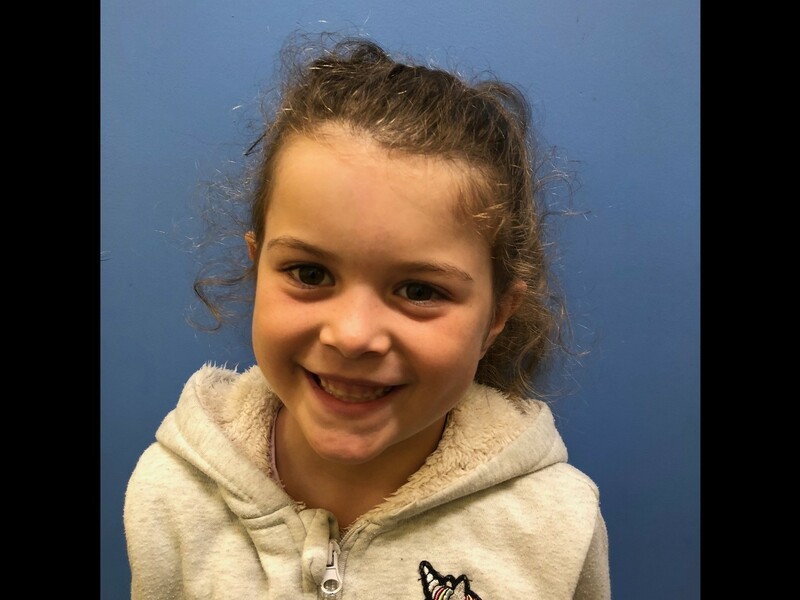 Mila Minnear for pushing through challenges to become a confident and caring member of our classroom. What a great start to school! 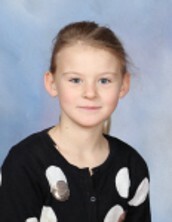 Jae Tilby for making great efforts in her learning and maintaining positive energy in all she attempts to do. 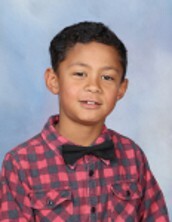 Isaac Morrison-Fonoti for bringing a positive and bubbly personality every day. He has been making great choices during work and striving for excellence. Jasmine Dixon for taking risks and stretching herself by pushing outside of her comfort zone in leadership. Keep rising to the challenges you set for yourself and others. Our school roll is currently is 332. This week we welcome Lucas Flay, Zaine Dobson, Jayden Dobson, Charlotte Doherty and Lily Suter to Inglewood Primary School. 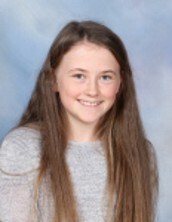 to Lily Suter, Charlotte Doherty, Nathan Gillett, Tyson Pittwood, Reef Ward, Hanna Osborne, Baylin Ferguson and Matthew Tee who are celebrating their birthday's this week. 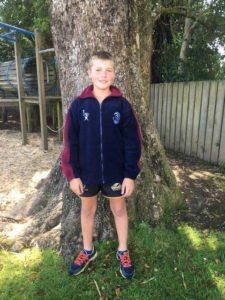 Please ensure all Term 1 ECF payments for the Junior and Middle Teams are paid in the next week to enable your students to attend the upcoming team trips planned this term. 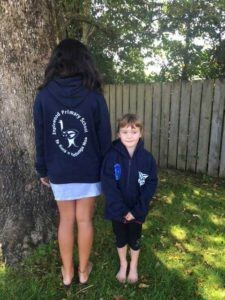 This fund covers all school trips, visiting performers, Life Education and visits. Please do not park in the carparks by the Dental Clinic. These are owned by the Taranaki District Health Board and for dental clinic patients and staff only, and are constantly used. We have a number of cars who are thoughtlessly parking in the Bus Stop to drop off their children. Please note that your details are forwarded to the Police. This is a no stopping zone. Naming and shaming is not our game but protecting and keeping students safe is, so consider your actions and the possible consequences. We thank all those parents who do the right thing and respect the safety of our students. Especially for parking well and using the crossings. Purchasing the packs of little chips or other items is not cost effect let alone kind to our planet. By purchasing larger packs and putting smaller amounts into partitioned lunchboxes or reusable named containers or reusable/re-sealable plastic bags will save in the long run. To save your child throwing out the bags, give them the responsibility of washing them out and or ensuring they put them up with their lunch box (developing responsibility). You can initially offer a reward that can in time be removed as it becomes an expectation. 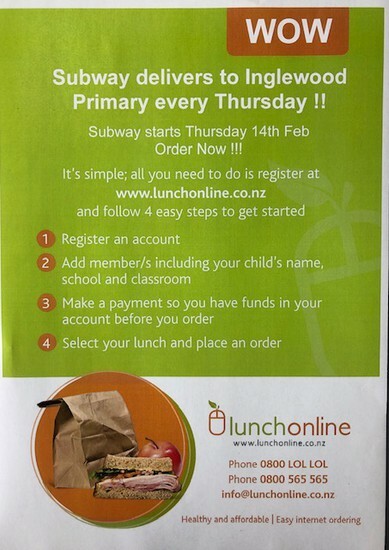 If you have some excellent ideas and would like to contribute to this project with ideas or promotions, contact Vicki Ritchie vicki.ritchie@inglewood.school.nz . We have a large amount of lost property at school. Please check the plastic bin in the hall foyer for your child's belongings. These were held last week in very good conditions. Some fantastic swimming took place and there were some tight finishes in a number of the races. The champions for each year group will be acknowledged in next weeks newsletter and receive their trophies at an upcoming assembly. As always many thanks to the parent helpers, and staff that made this event a success. Students who have made the Town vs Country squad have been informed of their selection and hopefully have returned their permission slip. This event is to be held Friday April 5 at Stratford. Chocolates: A reminder to keep selling those yummy Whittakers Chocolates and return the money to school. Organic Grapes: $5 per kg. Please contact the school office for orders. Pine Cones: Please see the school office if you would like to order a bag. $5 each. Annual General Meeting: Our AGM was held this week. Special thank you to Crystal Hilton and Lara Phillips who have stood down from their official positions. Your support of our school has been amazing. Congratulations to our new office holders - Chairperson Kirsty Leslie-Ellis, Secretary Nicola Maul and Treasurer Suzanne Davy. Anderson Pie Orders were sent home with all students this week. This is an awesome fundraiser to stack up your freezers ready for winter. All orders to be returned to the school office by Thursday 9 May. Thank you for you support. and help this project come to fruition/completion. 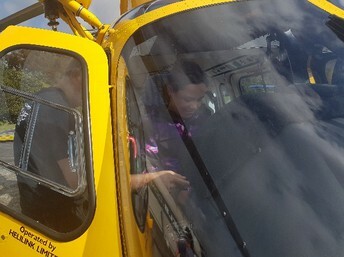 Thanks to Sienna Dobson who won a competition to take her class to the Hangar. 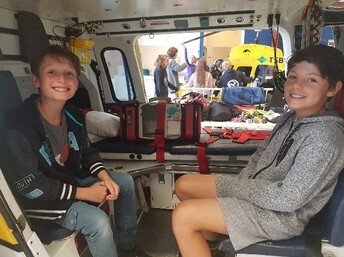 Fergus (Pilot) and Andy (Crewman and paramedic) were very entertaining and had Room 9 captivated. Below are some of the learning expressed in their thank you letters. 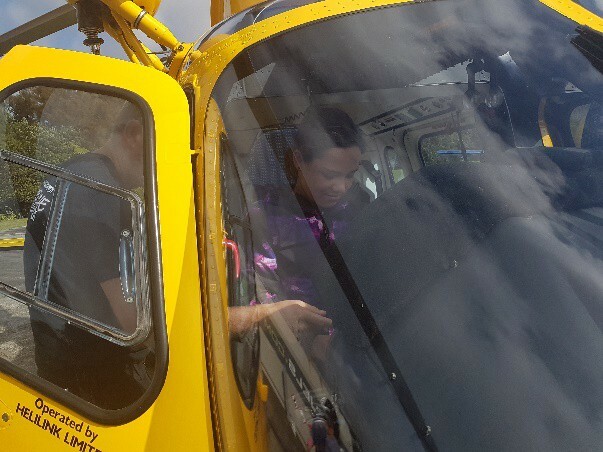 Winner of the competition - Sienna in the pilot's seat. 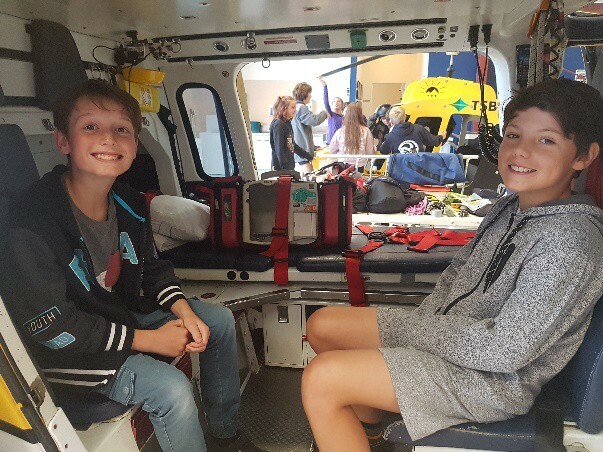 Charlie and Jake enjoying their chance to sit in the helicopter. This year we have applied for hours for classical guitar lessons again. Should your child be interested in attending these free ‘half hour lessons’ to be held on a Tuesday afternoon at 3.15 – 3.45pm and 3.45pm – 4.15pm, please contact the office to enrol. Students will be grouped in ability/age groups. Limited places. Lessons will be for a 30 week period (excluding school holidays) and will be held in our school library. For ages from: 8yrs – 13yrs. All students will require their own guitar to enable practice at home etc. While the 1/2hr lessons are ‘free’, there will be a charge of $10 to cover the cost of photocopying etc. Inglewood AFC: It' not too late to register!!! We are still looking for more First Kicks, Fun Football, U9, U10, U11, U12, U13, U15 & U18 players. We need to know ASAP if there are more players available for these teams and we require more coaches.Please contact Cody Huta via email at inglewoodafcjuniors@gmail.com or on 027 555 1716Volunteers Wanted to help with the United Church Op Shop 9.30am to 12.30pm or 12.30pm to 3.00pm. Please phone Mia 7567180 (evenings) or 0273445724. Florist: Please support our local new florist at 121 Rata Street, Inglewood - The Love Bunch Florist. Stephanie Valentine has an amazing range of flowers for bouquets, arrangements, weddings and funerals. Phone 0272879780 or email thelovebunch@xtra.co.nz. 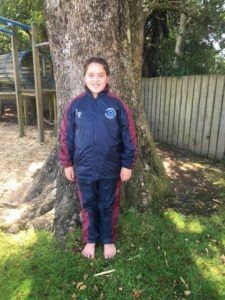 Please click on the link to order directly from our school website or pop into the school office. Please note all Polo Shirts will be $15 for Term 1 2019 - get in quick.